‘Let each day be Earth Day’. This was the resolution taken by the students and teachers of Paramount International School ( Sector 23, Dwarka) on Earth Day. 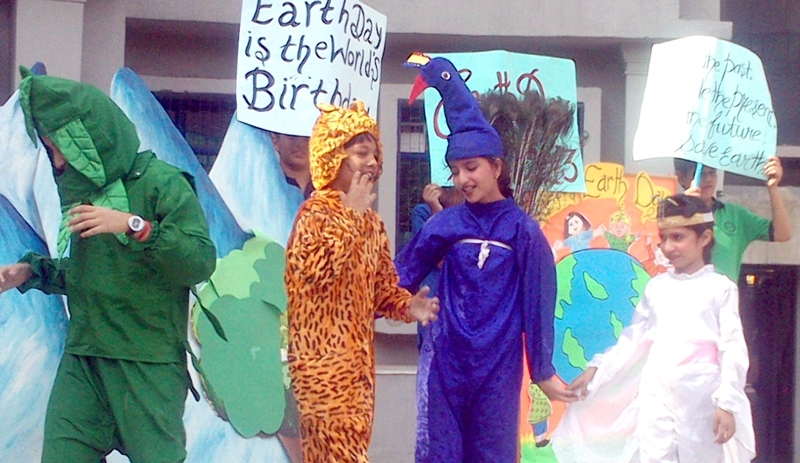 To mark the birthday of Earth Day- a grand special assembly was conducted by the Eco-Club of the School. As the assembly proceeded, the students were awestruck by the plethora of information and activities being conducted one after the other. The entire school especially the assembly area was decorated with beautiful banners, informative posters and meaningful placards-all conveying the message-Go Green-Plant more Trees, Follow the three R’s and save our Mother Earth. The Eco-Club in-charges explained the significance of Earth Day celebration. This was followed by a mesmerising skit by the students portraying the bounties of nature and how man has harmed, damaged, destroyed and depleted many of them. Thereafter, the children pledged to save their mother earth by following all the do’s and don’ts. Next was the ‘Plantation Campaign’. Several medicinal saplings were planted in and around the school premises to promote Green Campaign. A rally was taken out by the senior students of the school, with banners, posters and placards to create awareness about saving Earth. Apart from this the in-house activities consisted of a theme based drawing competition on: Global Warming. Paramount International School again lived upto its principle of making the students aware and sensitized about the current issues plaguing the world and making serious efforts to do their bit!! What can I do for a CORRUPTION FREE WORLD?